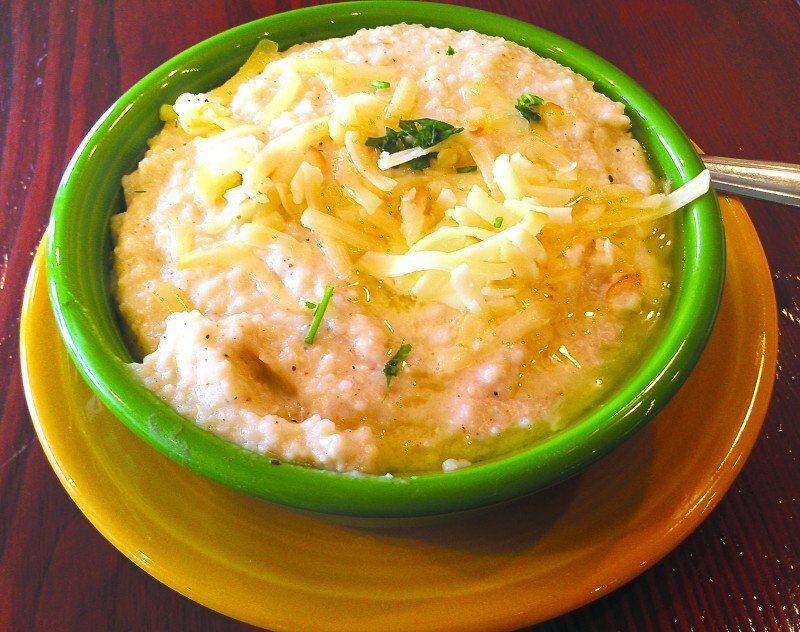 Sardine, located on Machinery Row, serves white cheddar grits at weekend brunches. Other spots to find the southern specialty include Willalby’s Cafe and Lazy Jane’s on Williamson Street, Melly Mel’s off the Beltline, Brickhouse BBQ near campus and Crema Cafe in Monona. The grits at Willalby's Cafe. Chef Dave Dorst is on a mission for grits. As head of the kitchen at Crema Café in Monona, Dorst is neither southern — he went to Madison La Follette High School — nor is he cooking a predominantly southern menu. Crema’s brunches are most likely to be influenced by Door County cherries, local cheese and heritage ham. But Dorst’s crusade for grits, the thick, white breakfast porridge served at every Waffle House in the South, isn’t based on logic. It’s based on love. “I started making grits here because I personally love them, and I find that most people have a misconception about grits from the get-go,” Dorst said. “They have a huge stigma. Hominy grits, like polenta, are simply cornmeal — coarse flour ground from maize, or field corn. Instant grits have been partially cooked and are often bland, as are grits made only with water. Brette Warshaw, writing on the website Food52, recommends that home cooks “look for the words ‘stone-ground’ when shopping for any kind of cornmeal. To prepare his grits, Dorst starts with a liquid combination of housemade chicken stock and whole milk or heavy cream. When that’s boiling, he “rains” in the grits, stirring slowly, and cooks them on medium-low heat for about 10 minutes or until they’re creamy. 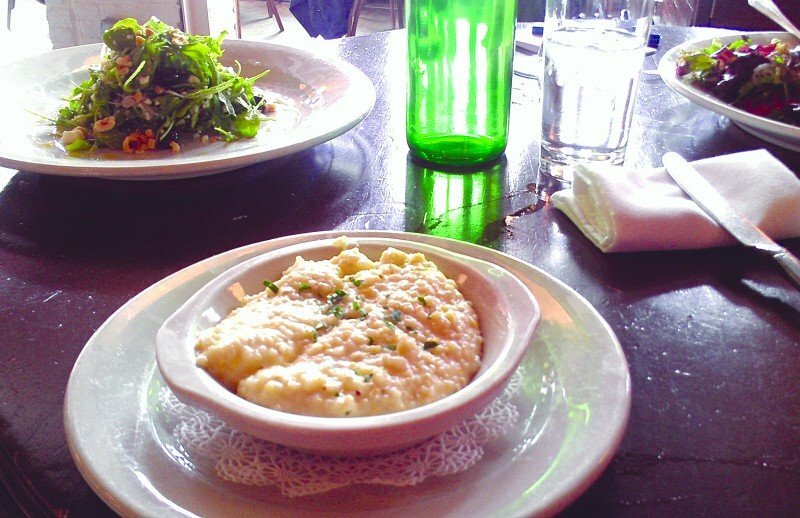 Crema’s grits are characterized by two main elements — Farmer John’s smoked gouda, showered over the top with a pat of butter and a sprinkle of parsley, and a healthy dose of fresh cracked pepper. “I’m a pepper fiend,” Dorst said. Elsewhere in Madison, Melly Mel’s off of the Beltline serves grits mostly for breakfast, often with eggs, bacon and toast. Owner Carmell Jackson isn’t from the south, either (though her father is). “We serve grits every day,” Jackson said. “They’re basically a staple. People get fish and grits, pancakes and grits. Chef Shane Hendrix at Brickhouse BBQ most often serves grits alongside the restaurant’s smoked brisket and pork. The pans sit next to each other on the steam table, which means the grits are often looser and smokier than usual. At Brickhouse, Hendrix starts with chicken broth, adding fresh thyme, garlic, salt and pepper at the beginning and sharp Wisconsin cheddar and parmesan at the end. Before serving, he adds heavy cream to loosen them up, but not make them soupy. At Crema, Dorst insists that the deliciousness of his grits starts not with the cornmeal, but what he cooks it in. “It’s all dependent on the liquid you use,” Dorst said. “You’ve got to really season those things. You have to put some work into it. We put a dollop of butter on top … the more things like that you use, the quote-unquote ‘better’ it’s going to be. Brickhouse BBQ, 408 West Gorham St.
Lazy Jane’s Café , 1358 Williamson St.
Sardine , 617 Williamson St.
Willalby’s Café , 1351 Williamson St. Created by Dave Dorst at Crema Café, Monona. Serves 1-2 generously. In medium sauce pot, bring stock and milk to a boil. Slowly “rain” in grits, stirring while adding to liquid. Lower heat, and continue stirring for 10-15 minutes until grits become creamy. Add seasonings, adjust to taste. Add shredded cheese at end, reserving some for garnish. Top with a little butter and shredded cheese. *Some store-bought stock can be high in sodium, be careful not to over salt!